Space is big. Really, really big. Even Starfinder's galaxy, one of trillions in the larger universe, is a vast expanse from a humanoid perspective, and the best way to traverse these almost incomprehensible distances is with a starship! Many starships are commercial workhorses, hauling cargo from one world to another; other ships ferry passengers between pockets of civilization in Near Space or the Vast; and some ships, bristling with armaments or packed with troops, are weapons of war. 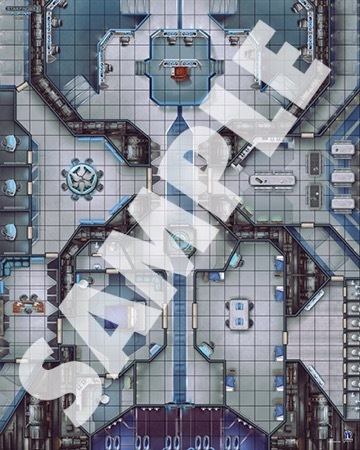 Launching out of spacedock this month is Starfinder Flip-Mat: Warship, ready to land one of these intimidating military vessels on your tabletop! 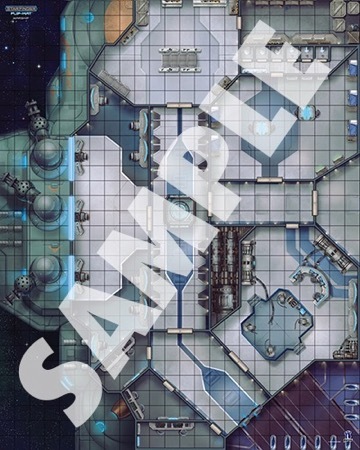 Perfect for representing a cruiser, a battleship, or even a dreadnought, Starfinder Flip-Mat: Warship presents two different miniatures-scale maps: the ship's bridge and command-and-control center, and one of its gun decks, complete with capital weapons! 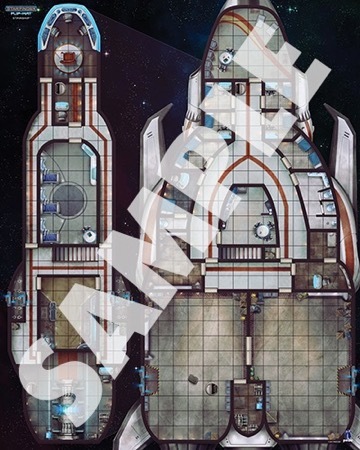 If interstellar war is not your style, there are plenty more Starfinder Flip-Mats featuring less... aggressive... starships for your game. 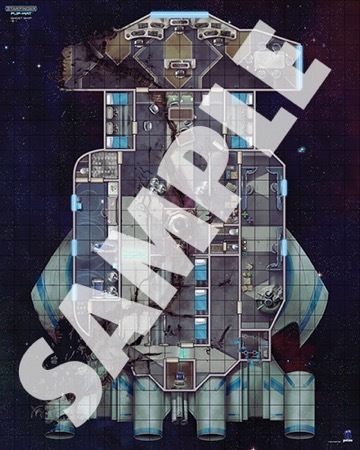 When your heroes happen across a derelict ship tumbling through space, Starfinder Flip-Mat: Ghost Ship has you covered, with an abandoned tramp freighter on one side, and a scientific research vessel that has clearly suffered some sort of outer space calamity on the other. But Starfinder is a game of characters as well as starships, and science-fantasy heroes need a ship of their own to ply the space lanes between worlds. 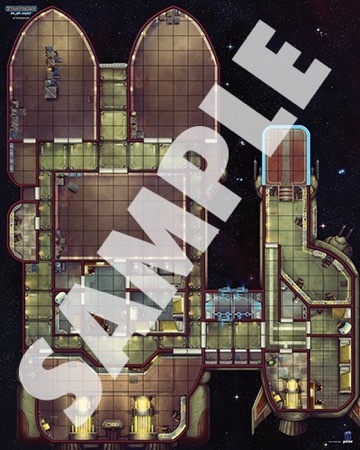 Starfinder Flip-Mat: Starship gives you two different starships, each suitable as a mobile base of operations for player characters, whether they're piloting an elegant exploration craft with two decks or a well-used working freighter with plenty of cargo space. If your heroes are of a more martial bent, the freighter can also double as a military dropship, its cargo holds ready to host platoons of marines for invading hostile planets. 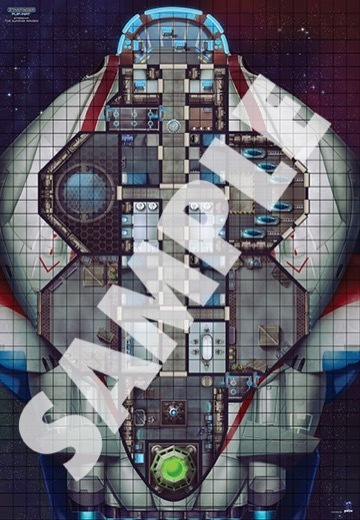 Another option is Starfinder Flip-Mat: Starship, The Sunrise Maiden, showcasing a ship familiar to players of the Dead Suns Adventure Path. Over the course of the campaign, the Sunrise Maiden carries the heroes of Dead Suns from the civilized Pact Worlds to the unexplored reaches of the Vast, but it can represent almost any Medium starship used by player characters. 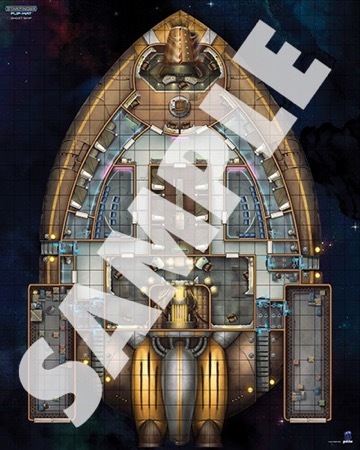 This oversized Flip-Mat includes maps of both the Sunrise Maiden's interior compartments and a portion of its exterior inside a docking bay. 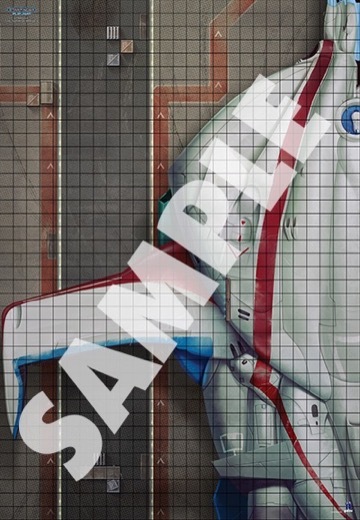 Whatever your crew, and whatever your destination, you can find the perfect starship for your game on a Starfinder Flip-Mat! Space is big. Really, really big. Pfft. It's peanuts compared to the walk to the chemist down the road. Seems to me like Ghost Ship could also double as a players’ ship. Why did I not know about these earlier? Man, new subscription time!! "the best way to traverse these almost incomprehensible distances is with a starship"
I would argue the best way would be interplanetary magic, but starships are a strong second option! yeah, I like the design as well. Been thinking about picking that one up to remodel as a player ship myself.